We’ve covered compact tumble dryers in our review series of compact and portable dryers, and now we’re taking a look at compact spin dryers. What are Spin Dryers all about? Spin dryers use high rotational speed to extract 80-90% of water from laundry. Spin dryers can be used as a supplement to a compact tumble dryer to reduce load drying times. The spin dryers we’re covering here don’t use heat to dry laundry. You only need a 110-120V outlet. No permanent installation. Store the spin dryer away when it’s not in use. Compact tumble dryers are an excellent choice for small homes or apartments, boats, and RV’s, but they come with their own challenges. They’re miniature versions of the traditional tumble dryer and are great replacements for their full-size counterparts in many situations. However, even if you get a “ventless” model, you still end up with hot air getting released into the room. Spin dryers are a solution that aims to get your clothes 80-90% dry so that they can be hanged, or tossed in a traditional dryer for a shorter amount of time. If you can hang your clothes, then a spin dryer will speed up the drying process. Spin dryers can also supplement a compact tumble dryer. The more water you extract from your laundry before tossing it into the dryer the quicker it will dry. That also means you have to run the tumble dryer for less time, thus heating up your living space less. The models we’ve selected below are some of the most popular and well-known spin dryers. Check out the comparison table, and we have more information about each model down below. Unless you’re looking to go super compact, the Laundry Alternative Mega Spin Dryer is a great option with high capacity. It has the same capacity as the Panda but comes with a 3-year warranty. The maximum rotational speed of the Panda is nearly double the Laundry Alternative so you can expect it to extract more water in a shorter amount of time. Keep in mind, that these spin dryers do not completely dry your laundry. They spin and compress the laundry against the wall of the drum. The laundry will still need to be hung to finish drying or thrown into a tumble dryer. The estimated usable volume for the two largest spin dryers are as follows. While the overall size of the spin chamber is larger on the Laundry Alternative, it is made of plastic. You will want to stick with the recommended weight limit of 22 lbs so that you don’t damage the dryer. The Panda has a smaller overall volume but is still capable of holding 22 lbs of clothes as well. The spin chamber is stainless steel, and that’s why it’s capable of withstanding the faster RPM’s. The Panda Portable Spin Dryer is probably the quickest option on the list. The dryer works by spinning your clothes to 3200 RPMs. This speed causes most of the water in your clothes to be strained out, and then drain out the bottom of the dryer into a bucket or pan you’ve placed beneath the drain’s spigot. This particular technique of drying is very energy efficient and takes almost no time. The caveat to all this is that your clothes will be somewhat damp at the end. 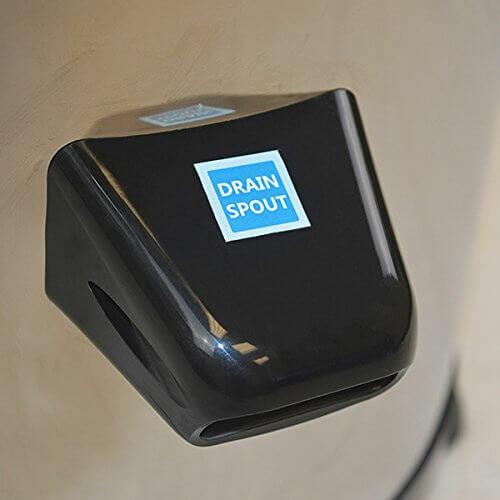 stainless steel that ensures a very long life from the machine while the water draining means that this dryer can be brought just about anywhere, as long as you have a 110V outlet and a bucket. Plus, the size makes this an excellent choice for a portable dryer as it weighs in at only 26 pounds and is just over two feet tall. it is much gentler on your clothing than a heated dryer. The only downsides are the fact that your clothes will never be completely dry from this technique and the minor amount of prep required by place a bowl or bucket beneath the spigot. It’s a small trade-off to be made for the benefits of space, time, and quality. Being made from plastic means the L.A. Mega Spin Dryer is super lightweight. If you plan on storing it away when not in use, such as with an RV or boat, then you’ll find it’s easy to set up and carry from one place to another. Depending on the material you can expect clothes to be dry 3-4 hours after being hung up. For larger sheets and blankets, you can expect it to take longer. You won’t be able to fit large, fluffy comforters in these types of dryers, especially king or queen size. As an example, you can fit 3 to 5 full-size towels along with a few washcloths, or a few pairs of jeans. The key to maximizing each load is to evenly distribute the laundry around the spin chamber so that it’s balanced. pounds and 24 inches tall, making it the second smallest on our list by height. Compared to a standard dryer, the size is absolutely miniscule. The Nina spins slightly faster than the Mega Dryer above, at 1800 RPMs. You get the same performance with half the capacity and a smaller footprint. If you like the Laundry Alternative products, but need something smaller than the Mega versions, then the Nina is for you. Spin dryers are a low-power, low-cost alternative to the traditional tumble dryer. You can use them alongside a compact tumble dryer if you don’t have space or plumbing for a conventional dryer. If you’re on the road or on the water, keeping one of these compact spin dryers stowed away is a great idea to speed up your laundry routine. They’re lightweight and are easily tucked away when not in use. Avoiding laundromats is much easier when you only have to wait a few hours for your laundry to completely dry while hanging as opposed to all day.